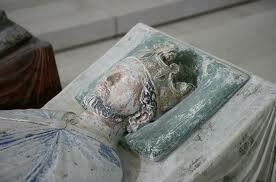 Prince Henry was born on 11 Feb 1155, the second of Henry II and Eleanor of Aquitaine’s sons. Five years later he married the daughter of King Louis of France – Marguerite, her dowry was the Vexin region and Henry’s father King Henry II was keen to extend his empire. At seven Prince Henry was sent off to the household of Thomas Becket – the arrangement didn’t last long. On 14 June 1170, Henry II had Henry crowned king of England at Westminster. The Archbishop of York did the honours as Thomas Becket, by then Archbishop of Canterbury, was in exile. From that point forward Henry is known in history as the Young King. He is the only English monarch, even if he doesn’t feature on most lists of kings and queens, to be crowned during his father’s lifetime. And in all honesty the problems that followed between father and son were largely because the title was an empty one. King Henry II wasn’t doing anything politically innovative but he was avoiding potential disputes about the succession, remember Henry was the second son, and making a statement about how unimportant Becket actually was. This wasn’t helpful as there was a bit of a tug of war relating to whether York or Canterbury was more important. Becket was furious because he believed that Canterbury crowned English monarchs. York basically stuck his tongue out at Canterbury by waving a letter around from Pope Alexander III which gave the King of England the right to have Prince Henry crowned by whoever he wanted. Becket upped the ante by excommunicating the Bishop of York and the other bishops who had assisted in the coronation. So much for Henry II trying to curb the power of the Church. After Becket’s death there was a second coronation – on 27thAugust 1172 at Winchester for the prince and his princess. This coronation wasn’t unusual either – medieval kings where in the habit of reminding their subjects who was in charge by being crowned on more than one occasion but in this instance Henry II was remedying a perceived slight to King Louis of France in not having Marguerite crowned alongside her husband at Westminster. With Becket dead – the Bishop of Rouen crowned the pair. Unfortunately the Young King expected power and finances to go with the title. When this was not forthcoming he revolted against his father in 1173. Henry II was ultimately victorious in the family dispute but one of the consequences was the imprisonment of Eleanor of Aquitaine who had sided with her sons. The Young King got more money out of the deal but no more power although he was sent to fulfill various ceremonial duties on his father’s behalf. Instead of political power the Young King turned to the tournament and jousting. Henry was supported in his new role by a knight in his household – William Marshall. The pair travelled around Europe gaining reknown at the tourney. They fell out in 1182 when Marshall was accused of being a little too close to Marguerite. By the end of the year the Young King was in rebellion once more and in 1183 he died having taken to pillaging monastic houses to finance his campaign. He died from dysentery and as a result of his death William Marshall, who had reconciled with his young lord and received permission to rebel against the king, went to the Holy Land to lay the Young King’s cloak in the Holy Sepelchre. William Marshall had his first taste of real battle at Neufchatel in 1166 when he demonstrated his bravery but failed to take any of his opponents for ransom. Once peace was restored to Normandy Marshall, now a knight, found himself without a mesnie or household. He was permitted to join his cousin the Lord of Tancarville entourage as it travelled to Sainte Jamme for a tournament. Marshall having had his horse killed from under him at Neufchâtel was in desperate straits. Ultimately Tancarville permitted him the last horse remaining in his stables. By the end of the day Marshall was the owner of four destriers or warhorses. Between 1167-68 Marshall travelled the tournament circuit. He soon gained a reputation for strength and valour on the field. This wasn’t always to his advantage. At one tournament Marshall was attacked by five knights- who managed to turn his helm so that until he was finally captured he could not see a thing. On another occasion a smith was required to remove his helm at the end of the tournament because it was so badly battered. Tournaments were banned in England so when Marshall returned home in 1168 he was forced to give up what had become a lucrative income for him but by 1170 having been taken into his uncle, Patrick of Salisbury’s mesnie, he’d seen conflict in Poitou, been held captive by the de Lusignans and ransomed by Eleanor of Aquitaine he was part of the household of Prince Henry, eldest son to Eleanor and King Henry II. The king had his son crowned in London in 1170 so that for the once and only time in English History there were two officially recognised monarchs in England – King Henry II and the so-called Young King. Unfortunately the Young King may have had a title but he didn’t receive the income he felt he deserved or the power. Bitter words escalated into rebellion. There followed a “war without love” – that ended with Eleanor a prisoner for having encouraged her sons to rebel against their father. After that rather unpleasant interlude it was probably with some relief that Marshall found himself drawn back into the world of the tournament from 1176 onwards. The Young King had been out manoeuvred by his father so the tournament became a way of gaining the respect of his peers and annoying his father who did not approve of tournaments. 1176 was not a shining example of knightly success for Marshall. He and the Young King had to learn tactics in much the same way that any team learns how to play their opponent to best advantage. Marshall watched and learned – most notably from Count Philip of Flanders- and before long Team Young-King was going from strength to strength with Marshall as their tournament organiser. At Anet the tournament spilled over into the town with one of Marshall’s captives hoisting himself out of his saddle onto an overhanging gutter so that although Marshall gained a horse and harness is lost a valuable ransom. At Pleurs, Marshall won the accolade of most valiant knight but this was also the occasion that his helm had been so badly battered that he had to seek a blacksmith in order to escape his own headgear. At Eu he captured ten knights and twelve horses in a single day and at Epernon a thief tried to steal his horse under cover of darkness but was foiled by Marshall’s determined pursuit. Later Marshall formed a partnership with Roger of Jouy so that they could benefit more fully from the loot available on the tournament field. Marshall may have gained a reputation for being an honourable man but his early experience at Neufchatel had taught him that a man was only so good as what he owned. They kept a carefully tally of their victories. By the time that the tournament of Lagny-sur-Marne took place in the autumn of 1179 with 3,000 knightly participants. both William Marshall and the Young King had reputations as elite warriors. The Young King is sometimes described as the “father of chivalry” so great was his reputation. However, the glory years were nearly over. Men within the Young King’s household had grown jealous of Marshall and they spread the rumour that not only had Marshall grown too big for his boots but that he was carrying out an affair with the Young King’s wife – Queen Margaret. One of the men responsible was called Adam Yquebeuf, another was Thomas of Coulonces whilst the third was the Young King’s seneschal. Marshall’s biographer knew of two other plotters but didn’t name them as their descendants were alive and well in the 1220s when Marshall’s biography was written. During the Christmas festivities of 1182 at Henry II’s court at Rouen, Marshall demanded the right to a trial by combat which was forbidden. He was once again without a mesnie…until the Young King had need of him once again. Henry II, Richard de Lucy and three pike. 19 December 1154 – Henry II, also known as Henry FitzEmpress was crowned at Westminster Abbey along with his wife Eleanor of Aquitaine. Young Henry ascended to the throne after King Stephen’s death according to the agreement made at the Treaty of Wallingford that marked the end of the civil war that had raged between Stephen and Henry’s mother the Empress Matilda for nineteen long years. Henry’s coronation brought with it the promise of peace and incorporated England into a vast empire which Henry’s youngest son John would ultimately lose. Henry, by the grace of God, king of England, duke of Normandy and Aquitaine and count of Anjou, to all the earls, barons, and his faithful, French and English, greeting. Know that, to the honour of God and of the holy church and for the advantage of my whole kingdom, I have conceded and granted, and by my present charter confirmed to God and to the holy church, and to all the earls and barons, and to all my men all the concessions and grants and liberties and free customs which King Henry, my grandfather, gave and conceded to them. Similarly also, all the evil customs which he abolished and remitted, I remit and allow to be abolished for myself and my heirs. Therefore, I will and strictly require that the holy church and all the earls and barons, and all my men should have and hold all those customs and grants and liberties and free customs, freely and quietly, well and in peace, and completely, from me and my heirs to them and their heirs, as freely and quietly and fully in all things as King Henry, my grandfather, granted and conceded to them and by his charter confirmed them. Witness, Richard de Luci, at Westminster. Richard de Lucy would become the Chief Justicar of England. He’d already proved himself as Sheriff of Essex. It was Richard who cared for England whilst Henry was elsewhere in his empire. Henry spent most of his life on the road travelling from one place in his kingdom to the next so it was essential that he had someone in England that he could trust. It was de Lucy who worked with Henry against Thomas Becket and managed to get himself excommunicated for his pains. It was also de Lucy who administered English legal reforms of the period. In 1179 de Lucy resigned his office and retired to Lesnes Abbey near Bexley in Kent which he had founded as part of his penance for his role in Becket’s murder. He died there a few months later. The coats of arms for the Lucy family is three fish – which initially bewildered me as I discovered fairly swiftly that the fish in question are pike. In Latin though, the pike is a Esox Lucius – Lucius meaning ‘light’ and being a pun on the de Lucy name.